There's a couple of newish cafes on Church Street, one of which has been the recipent of quite a lot of excellent press - that cafe is Coffee Hit. In a corner location, its size is quite deceptive - what appears to be two small shopfronts opens up into a labyrinth of rooms. Even at this early hour we find ourselves seated right at the back of the building in what is a converted garage. It certainly gets points for quirkiness. Service is a bit haphazard, our first coffee order seems to get lost and eventually after asking about it, they arrive 15 minutes into our stay. For a place called Coffee Hit, you expect the coffee to be spot on, unfortunately ours were too hot. 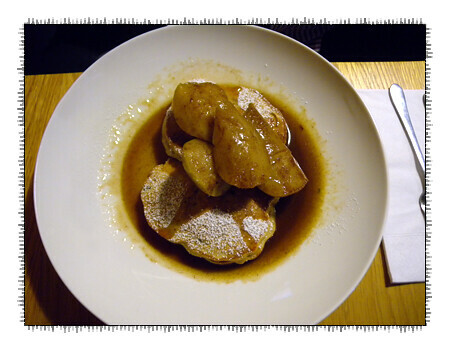 Ricotta Hotcakes served with stewed pear - the stewed pears were good, the hotcakes were not - too much on the stodgy side. 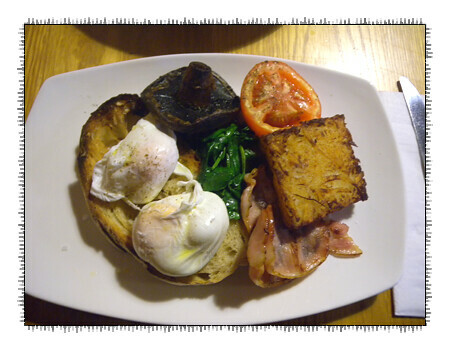 Hit Man Breafast - eggs, bacon, tomato, mushrooms, spinach, hand made hash brown served with soudough toast. Multiple faults on this plate - the major sin, hard poached eggs! The hash brown was so thick that the inside were uncooked. The mushroom was good while the tomato, bacon and spinach were tepid. It makes us wonder if we got them on a bad day or what seems to be the reality, places are not as good as they have hyped to be. From our experiences and those of our friends, this seems to be happening quite often that we're all beginning to wonder just how independent, independent reviewers are.